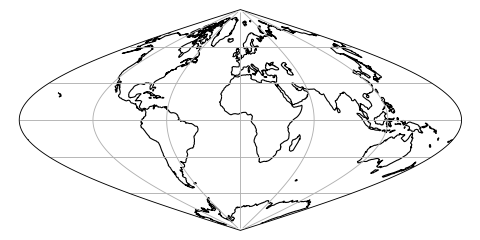 This projection is conic and equal-area, and is commonly used for maps of the conterminous United States. 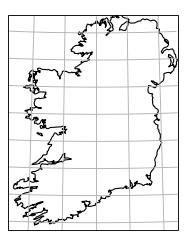 central_longitude (optional) – The central longitude. Defaults to 0.
central_latitude (optional) – The central latitude. Defaults to 0.
false_easting (optional) – X offset from planar origin in metres. Defaults to 0.
false_northing (optional) – Y offset from planar origin in metres. 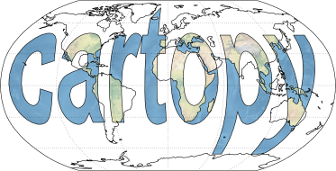 Defaults to 0.
standard_parallels (optional) – The one or two latitudes of correct scale. Defaults to (20, 50). 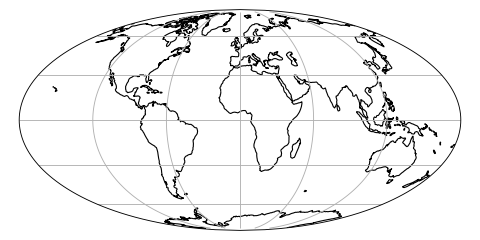 globe (optional) – A cartopy.crs.Globe. If omitted, a default globe is created. This projection provides accurate angles about and distances through the central position. Other angles, distances, or areas may be distorted. central_longitude (optional) – The true longitude of the central meridian in degrees. Defaults to 0.
central_latitude (optional) – The true latitude of the planar origin in degrees. Defaults to 0.
false_easting (optional) – X offset from the planar origin in metres. Defaults to 0.
false_northing (optional) – Y offset from the planar origin in metres. 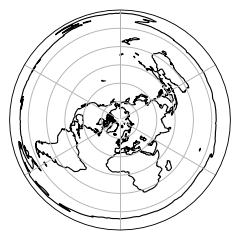 Defaults to 0.
globe (optional) – An instance of cartopy.crs.Globe. If omitted, a default globe is created. This projection is conic and equidistant, and the scale is true along all meridians and along one or two specified standard parallels. A Lambert Conformal conic projection. 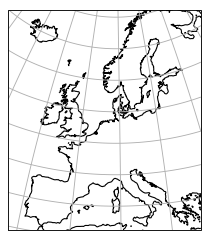 central_longitude (optional) – The central longitude. Defaults to -96.
central_latitude (optional) – The central latitude. Defaults to 39.
secant_latitudes (optional) – Secant latitudes. This keyword is deprecated in v0.12 and directly replaced by standard parallels. Defaults to None. 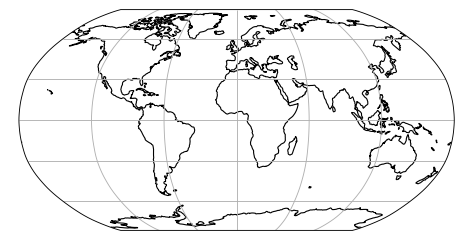 standard_parallels (optional) – Standard parallel latitude(s). Defaults to (33, 45). 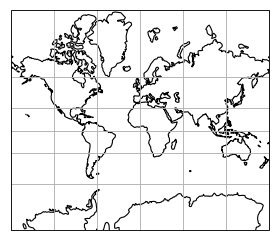 cutoff (optional) – Latitude of map cutoff. The map extends to infinity opposite the central pole so we must cut off the map drawing before then. A value of 0 will draw half the globe. 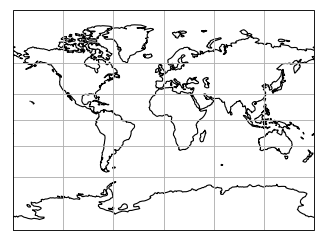 Defaults to -30.
min_latitude (optional) – The maximum southerly extent of the projection. Defaults to -80 degrees. 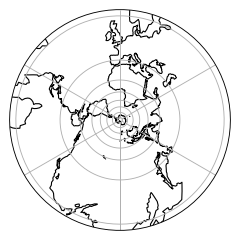 max_latitude (optional) – The maximum northerly extent of the projection. Defaults to 84 degrees. 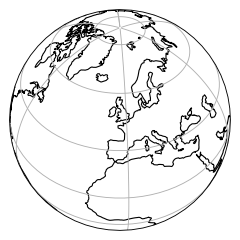 globe (A cartopy.crs.Globe, optional) – If omitted, a default globe is created. latitude_true_scale (optional) – The latitude where the scale is 1. Defaults to 0 degrees. scale_factor (optional) – Scale factor at natural origin. Defaults to unused. Only one of latitude_true_scale and scale_factor should be included. 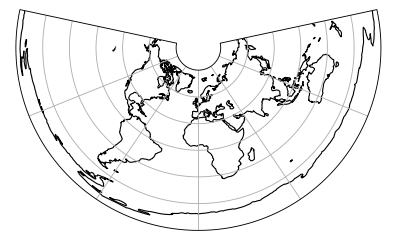 This projection is pseudocylindrical, and equal area. Parallels are unequally-spaced straight lines, while meridians are elliptical arcs up to semicircles on the edges. Poles are points. It is commonly used for world maps, or interrupted with several central meridians. 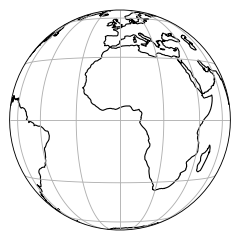 central_longitude (float, optional) – The central longitude. Defaults to 0.
false_easting (float, optional) – X offset from planar origin in metres. Defaults to 0.
false_northing (float, optional) – Y offset from planar origin in metres. Defaults to 0. If omitted, a default globe is created. 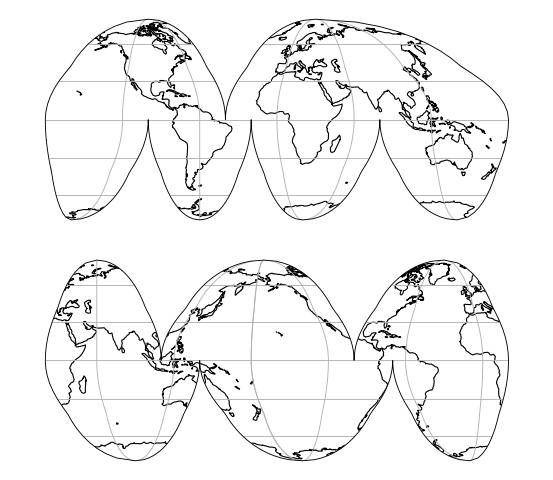 This projection does not handle elliptical globes. This projection is pseudocylindrical, and a compromise that is neither equal-area nor conformal. Parallels are unequally-spaced straight lines, and meridians are curved lines of no particular form. It is commonly used for “visually-appealing” world maps. scale_factor (optional) – Scale factor at the central meridian. Defaults to 1.
zone – The numeric zone of the UTM required. 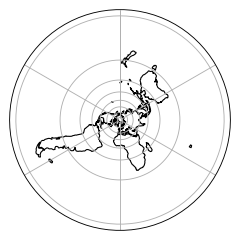 southern_hemisphere (optional) – Set to True if the zone is in the southern hemisphere. Defaults to False. 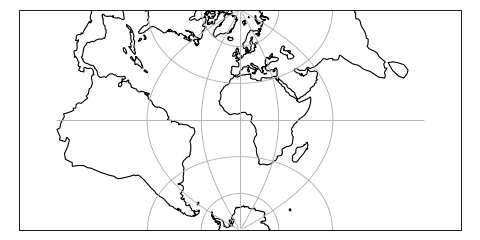 A rotated latitude/longitude projected coordinate system with cylindrical topology and projected distance. Coordinates are measured in projection metres. The class uses proj to perform an ob_tran operation, using the pole_longitude to set a lon_0 then performing two rotations based on pole_latitude and central_rotated_longitude. 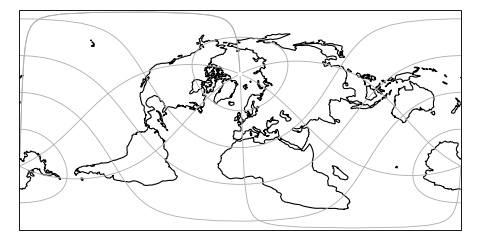 This is equivalent to setting the new pole to a location defined by the pole_latitude and pole_longitude values in the GeogCRS defined by globe, then rotating this new CRS about it’s pole using the central_rotated_longitude value. pole_longitude (optional) – Pole longitude position, in unrotated degrees. Defaults to 0.
pole_latitude (optional) – Pole latitude position, in unrotated degrees. 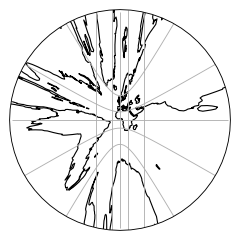 Defaults to 0.
central_rotated_longitude (optional) – Longitude rotation about the new pole, in degrees. 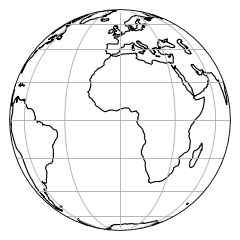 Defaults to 0.
globe (optional) – An optional cartopy.crs.Globe. Defaults to a “WGS84” datum. UTM Zone 32 projection for EuroPP domain. Ellipsoid is International 1924, Datum is ED50. A view appropriate for satellites in Geostationary Earth orbit. Perspective view looking directly down from above a point on the equator. In this projection, the projected coordinates are scanning angles measured from the satellite looking directly downward, multiplied by the height of the satellite. satellite_height (float, optional) – The height of the satellite. Defaults to 35785831 meters (true geostationary orbit). false_easting – X offset from planar origin in metres. Defaults to 0.
false_northing – Y offset from planar origin in metres. 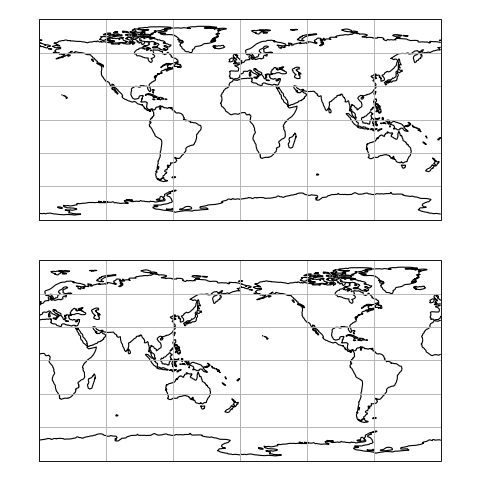 Defaults to 0.
globe (cartopy.crs.Globe, optional) – If omitted, a default globe is created. sweep_axis ('x' or 'y', optional. Defaults to 'y'.) – Controls which axis is scanned first, and thus which angle is applied first. The default is appropriate for Meteosat, while ‘x’ should be used for GOES. Perspective view looking directly down from above a point on the globe. 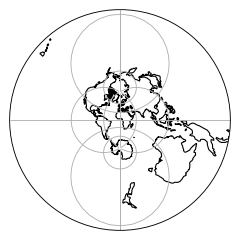 In this projection, the projected coordinates are x and y measured from the origin of a plane tangent to the Earth directly below the perspective point (e.g. a satellite). central_latitude (float, optional) – The central latitude. Defaults to 0. 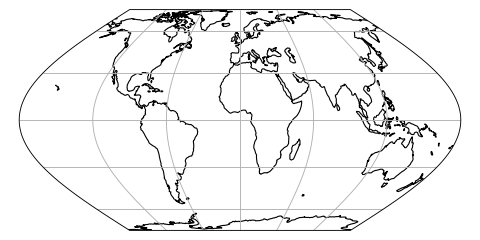 This projection is pseudocylindrical, but not equal-area. Both meridians and parallels are straight lines. Its equal-area pair is EckertII. 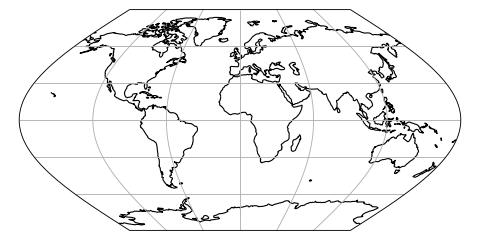 This projection is pseudocylindrical, and equal-area. Both meridians and parallels are straight lines. Its non-equal-area pair with equally-spaced parallels is EckertI. 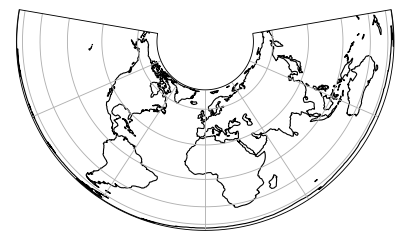 This projection is pseudocylindrical, but not equal-area. Parallels are equally-spaced straight lines, while meridians are elliptical arcs up to semicircles on the edges. Its equal-area pair is EckertIV. 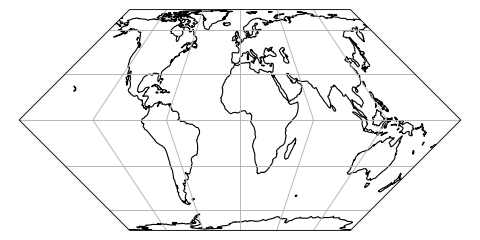 This projection is pseudocylindrical, and equal-area. Parallels are unequally-spaced straight lines, while meridians are elliptical arcs up to semicircles on the edges. Its non-equal-area pair with equally-spaced parallels is EckertIII. It is commonly used for world maps. 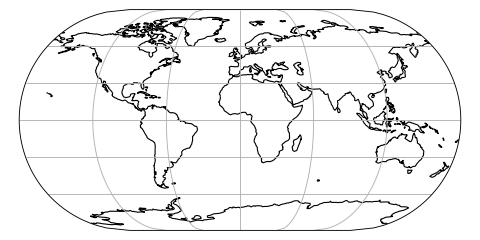 This projection is pseudocylindrical, but not equal-area. Parallels are equally-spaced straight lines, while meridians are sinusoidal arcs. Its equal-area pair is EckertVI. 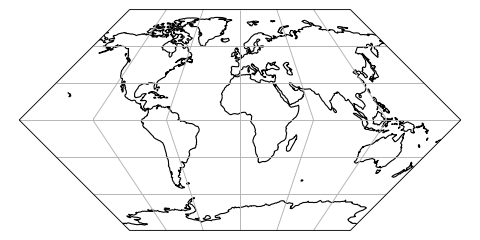 This projection is pseudocylindrical, and equal-area. Parallels are unequally-spaced straight lines, while meridians are sinusoidal arcs. Its non-equal-area pair with equally-spaced parallels is EckertV. 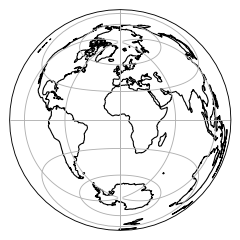 This projection is pseudocylindrical, and equal area. Parallels are unequally-spaced straight lines, while meridians are equally-spaced arcs. It is intended for world maps. To use this projection, you must be using Proj 5.2.0 or newer. 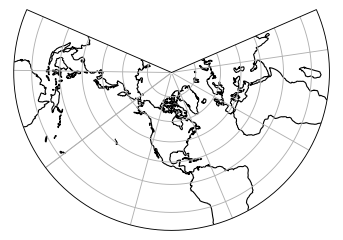 A Lambert Azimuthal Equal-Area projection. © British Crown Copyright 2011 - 2018, Met Office Created using Sphinx 1.8.2.